Visualization provides the option to easily determine how a model is connected with other models. It uses the UML data model diagram to represent the relationship between the models visually. Two different view options are available for visualization. Click on the "Model" icon and select the "Summary" option. 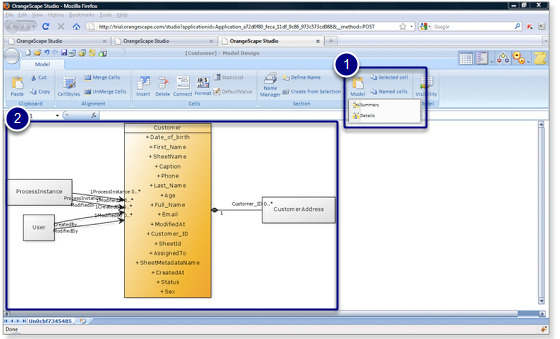 UML data diagram highlighting the currently opened model and its relationship with other models will be displayed. Customer model is connected to the system models "User" and "ProcessInstance". Customer model has a one-many relationship with the CustomerAddress model. Click on the "Model" icon and select the "Details" option. UML data diagram highlighting the currently opened model and its relationship with other models will be displayed. In this case, the atrributes of the related data models are also displayed. The attributes of the CustomerAddress model is also shown in the screen capture. 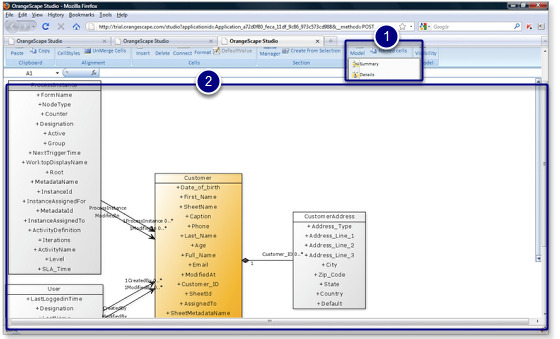 Let's open the CustomerAddress data model and check if a connection as shown in the visualization exists.